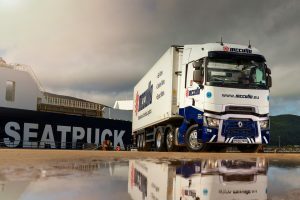 McCulla Ireland has put into service a Renault Range T520 High 6×2 tractor, one of the first right hand drive models in Ireland and the first for the temperature controlled logistics firm which is approaching its 50thanniversary year. Delivered by Diamond Trucks, the Renault dealer from Northern Ireland, the top of the range T520 High joins McCulla Ireland’s fleet of 100 trucks and 150 trailers, and will be supported with a manufacturer’s full repair & maintenance contract. The T High is hauling refrigerated trailers across Ireland, the UK and into Europe, making frequent trips to France, Benelux and Switzerland. The DTi 13-litre engine rated at 512hp is coupled to a 12-speed Optidriver automated transmission system. The straight six unit’s maximum power output is delivered between 1,430 to 1,800rpm with a maximum torque of 2,550Nm is available from 1,000 to 1,430rpm. Fuel is a major consideration for McCulla and the T High is specified with the latest fuel-saving technologies, like Optivision gear shifting strategy, which adapts the gear change to the topography of the route, cruise control with Optiroll controlled freewheeling. On the road, the T High is a commanding sight with cab components colour-matched for a striking finish and Dura-Bright aluminium wheels. “It is such an impressive truck, the driver, Stefan, absolutely loves it – in fact all the drivers would happily swap trucks to drive it,” adds Brian.